The country’s exports rose by 17.5% to $26.9 billion in October, mainly due to the low base effect even as trade deficit widened to $17.1 billion. The exports on monthly basis were down compared to $27.9 billion in September. Imports during October also rose by 17.6% to $44.1 billion. 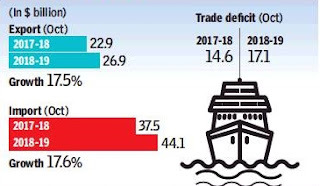 The trade deficit widened despite a steep decline of 42.9% in gold imports to $1.7 billion during the month under review. The trade gap was $14.6 billion in October 2017. Exporters attributed the growth in exports in October to a favourable base effect, as the foreign shipments in the comparable month of the previous fiscal were at $22.9 billion. The Federation of India Export Organisations said exports in October last year were even lower than that of September this year. 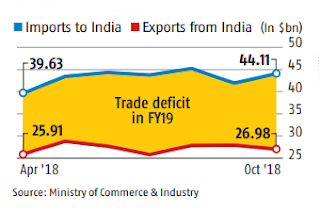 Sharing similar views, Engineering Export Promotion Council of India said high growth in October has come about on the back of a favourable base effect. FIEO president Ganesh Gupta demanded for augmenting the flow of credit as the sharp decline does not augur well for the sector.